Jake Gardner "projects menace" as the villain Scarpia in Hawaii Opera Theatre's production of "Tosca." 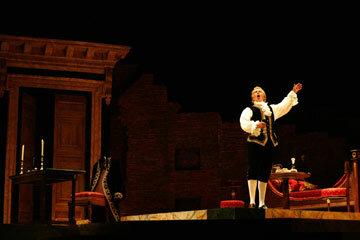 Jake Gardner fills in as Scarpia in "Tosca"
It's not often one gets to feel good about being so bad, but Jake Gardner's good luck is the result of someone else's bad luck. Because of a medical emergency, the lead role of Scarpia in this week's Hawaii Opera Theatre production of "Tosca" went to Gardner. "I think it's one of the greatest roles written, not only for baritone, but for any voice type," said Gardner, unable to suppress the (fiendish?) glee in his voice. "Scarpia is one of the greatest villains ever created in Western civilization. He's up there with Iago!" Indeed, Puccini's entire sordid tale of jealousy, passion and murder revolves around the Vaderish figure of Scarpia; he is the engine that sets the tragedy in motion. Luckily, Gardner, known as a pinch-hitter with a diverse repertoire, was close at hand, in the islands playing a double-header in HOT's "Il Trittico" two weeks ago. He has also played Scarpia before: "I had about 2 1/2 weeks to prepare. To learn a new piece, it usually takes about six months." In "Il Trittico," Gardner played the title character in "Gianni Schicchi," the third part of the trilogy, and that con-man character had his villainous moments, as well. "He was sort of a lower-class guy," Gardner explained. "He basically swindles this family out of their inheritance and impersonates the dead guy. In the end, though, he's not a bad guy because he gives everyone everything they want and then he takes two of the items and then he gives them to his daughter and their son as their dowry." In "Il Trittico's" first part, "Il Tabarro," he sang the role of Michele, who "commits a crime of passion when he finds out that his wife has cheated on him, and he kills her lover in a moment of passion" -- and if that doesn't sound like opera, what does? No matter the role, Gardner goes "to the words, how the composer has set them and then you sift them through your own self," he said. "Scarpia is so much fun to play because he makes these choices that I would never make. But I can certainly imagine and fantasize. It's really exploring the darker side of my own personality. Scarpia is pretty much larger than life in that he is the man who has all the power in the situation ... um, until he's stabbed, of course." Part of the power of great villains comes from projecting menace, and Gardner has made a point of sitting in various seats around the concert hall, imagining how best to connect with the audience. "It's all about acoustics; all about sound waves, two little vocal chords and 70 musicians. After that, it's acting, it's the sheer force of personality. Once I put on that cape, it's all about power, bouncing off the back wall."